Well, the DLC is almost here. 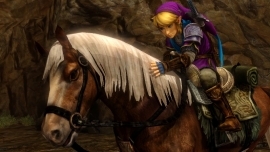 In just over 30 minutes or so from the time of this post, the Master Quest DLC will arrive for Hyrule Warriors. This is exciting times as we get to kick some arse with Epona, make Cia look like a white goddess, and enjoy some very awesome new stages and maps for Legend Mode and Adventure Mode. We get one last teaser before we experience it first hand… and I can’t wait. In fact I am only still awake so I can play with the new DLC right away. My excitement level is practically over 9000. You can get a full breakdown of what is contained in this DLC pack here.